I love the smell of book pages. It's right up there with the smell of new construction and freshly cut grass. And it's just one of the things I love about starting a new book. Before we headed out of town, I wanted to get a book to read over the break. While I am excited to spend time with family and friends, I'm also hoping to have some time to curl up next to the fire with a good read. I keep a list of reading recommendations in the coupon holder in my purse. That way it's always handy, and I'm not left stumped on what to check out when I go the library. So while out dropping off the rest of our Christmas cards yesterday, I stopped by the library and pulled out my list. Of the ten recommendations I had listed, only three were in stock. 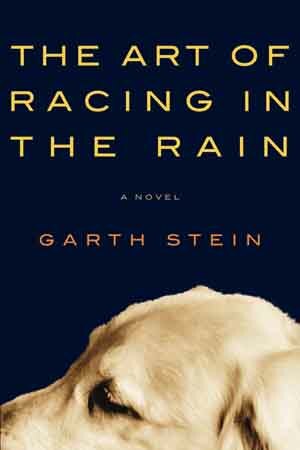 And out of those three, I selected The Art of Racing in the Rain by Garth Stein. I've heard nothing but wonderful things about this book. Nika Rolczewski from the Toronto Star says it "Pulls at your emotions. Love, devotion, death and betrayal - life's highs and lows, all paralleled with the sport of automobile racing and narrated by a dog named Enzo." And although I've been told that I'm sure to shed a few tears, and I am still excited to see what it entails. I'm ready to open up the book, smell the pages and begin the journey with Enzo. Mallory- thanks for entering my pillow giveaway on Charm Home. I love how you display your Christmas cards- I might have to steal that idea!